Professor Paul Monsour graduated from the University of Queensland in 1978 with a BDSc (hons). He completed a PhD in Oral Biology in 1987 and a Masters degree in Oral Radiology & Pathology in 1991. Professor Monsour was the first registered specialist in Oral & Maxillofacial radiology working in full time private practice on the East coast of Australia. Professor Monsour lectures extensively throughout Australia on all aspects of DMF radiology. Appointed the Foundation Professor of DMFR at the University of Queensland in 2009. 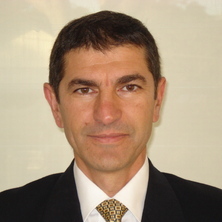 Paul is an associate member of the RANZCR and a Fellow of the International College of Dentists. Parashar, Vijay, Whaites, Eric, Monsour, Paul, Chaudhry, Jahanzeb and Geist, James R. (2012) Cone beam computed tomography in dental education: a survey of US, UK, and Australian dental schools. Journal of Dental Education, 76 11: 1443-1447. Mubarak, S., Symons, A.L., Forrest, A., Monsour, P. A. and Walsh, L. J. (2001) Educational impact of an interactive tutor for dental radiology. Australian Dental Journal, 46 4: S10-S10. Harbrow D.J., Robinson M.G. and Monsour P.A. (1992) The effect of chronic fluoride administration on rat condylar cartilage. Australian Dental Journal, 37 1: 55-62. Keur, JJ, Barrett, AP, Bower, RC, Lilienthal, B, Macdonald, R, Monsour, PA and Waters, B (1989) The Teaching of Dento-Maxillo-Facial Radiology in Australian Dental Schools. Australian Dental Journal, 34 5: 478-484. Monsour, PA, Harbrow, DJ and Little, GJ (1989) Microwave Irradiation as a Form of Fixation for Dental-Pulp. Australian Dental Journal, 34 3: 272-276. Monsour, PA, Kruger, BJ, Barnes, A and Sainsbury, A (1988) Measures Taken to Reduce X-Ray-Exposure of the Patient, Operator, and Staff. Australian Dental Journal, 33 3: 181-192. Monsour, PA, Kruger, BJ and Barnes, A (1988) X-Ray-Equipment Used by General Dental Practitioners in Australia. Australian Dental Journal, 33 2: 81-86. Monsour, Paj, Kruger, BJ, Barnes, A and Macleod, AG (1988) A Survey of Dental Radiography. Australian Dental Journal, 33 1: 9-13. Monsour, PA and Kruger, BJ (1987) Survey of Dental School Policies On the Management of Patients with Hepatitis-B or Aids. Australian Dental Journal, 32 5: 375-378. The effect of intravenous sodium fluoride and synthetic salmon calcitonin on plasma total calcium, inorganic phosphate, and ionic fluoride. Monsour, PA, Kruger, BJ and Harden, PA (1986) Prevalence and Detection of Patients with Bleeding Disorders. Australian Dental Journal, 31 2: 104-110. Savage, NW and Monsour, PA (1985) Oral Fibrous Hyperplasias and the Giant-Cell Fibroma. Australian Dental Journal, 30 6: 405-409. Effects of a single intravenous dose of sodium fluoride on plasma electrolytes and metabolites in rats, rabbits, and cockerels. Monsour P.A., Kruger B.J. and Barnes A. (1985) Calcitonin cell population and distribution in the thyroid gland of the rat. Journal of Morphology, 186 3: 271-278. Monsour, P. A. and Kruger, B. J. (1985) Effect of Fluoride On Soft-Tissues in Vertebrates. Fluoride, 18 1: 53-61. Monsour, Paj, Young, WG and Barnes, PB (1985) Styloid-Stylohyoid Syndrome - a Clinical Update. Australian Dental Journal, 30 5: 341-345. Monsour, Paj and Kruger, BJ (1985) The Use of Fluoride Preparations in Dental Practice. Australian Dental Journal, 30 2: 81-85. Monsour P.A., Kruger B.J., Petrie A.F. and McNee J.L. (1984) Acute fluoride poisoning after ingestion of sodium fluoride tablets. Medical Journal of Australia, 141 8: 503-505. Parashar, Vijay P., Whaites, Eric, Monsour, Paul, Chaudhry, Jahanzeb and Geist, James R. (2012). Cone beam computed tomography in dental education: A survey of U.S., U.K., and Australian dental schools. In: Abstracts for Posters Presented at the 2012 ADEA Annual Session & Exhibition. American Dental Education Association Annual Session & Exhibition (ADEA, 2012), Orlando, Florida, (234-234). 17-21 March 2012. Smid, J. R., Young, W. and Monsour, P. A. (2000). Degradation of rat enamel proteins by lysosomal proteases in vitro. In: Journal of Dental Research. 30th Annual Meeting of IADR ANZ Division, Adelaide, (1049-1049). 27-29 September 1999. Smid, J. R., Young, W. and Monsour, P. A. (1999). Distribution of cathepsin B in rat enamel organ during tooth development. In: Mark C Herzberg, Journal of Dental Research. 38th Annual Scientific Meeting of ANZ Division of IADR, Brisbane, (951-951). 27-29 September 1998.